45 years in San Diego. 45 years of cleaning experience. 45 years of repeat clients. A local family business since '71, we feature courteous service with the zinger - a solid two generation reputation of cleaning excellence. How can you go wrong? Professional. Guaranteed. San Diego. Cleaning. Trusted by the San Diegans who want a better experience than the norm, our 45 year old local company is here to clean and service San Diego’s carpets, hardwood, natural stone and tile and grout floors and counters as well as furnishings such as upholstery, leather furniture, area and fine rugs, drapery and blinds. . . even mattresses! 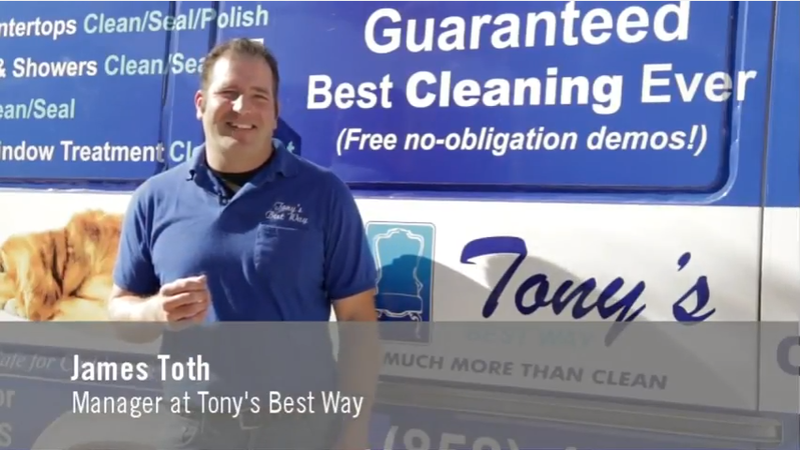 Click on video to join James Toth, son of Tony our founder, on a tour of our nine cleaning services. Also, take a peek at our interesting cleaning blog!